The number of water damage claims filed by UK homeowners has shot up over recent years, thanks in large part to the colder than usual winters. As cold weather sets in, there is the chance that your water pipes will freeze. When thawing, those pipes can burst, causing enormous amounts of damage to your home. 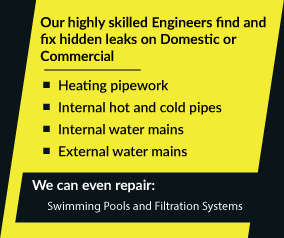 Water pipe leak detection services can ensure that you’re not taken unawares, and that any hidden problems lurking within your water pipes are caught and repaired before cold weather has the chance to cost you thousands of pounds. However, you cannot choose a water pipe leak detection service blindly. Many firms use invasive property searches to locate pipes at risk of leaking or that have already developed a small gas leak. This can tack on hundreds of pounds in additional fees. An expert water pipe leak detection company will use non-invasive search techniques both within and outside your home. They will also be able to locate leaks on water supply pipes (both hot and cold), as well as on a range of heating systems. 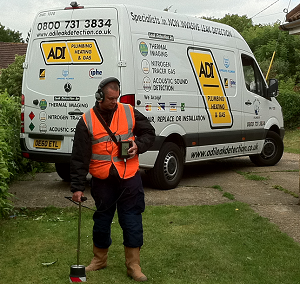 Before freezing weather costs you thousands of pounds, call ADI at 08007313843. There is no other firm that offers the same level of professional commitment, service and value.